colleagues, new equipment, ideas for repertoire, ideas for teaching. Much more than that, however, one comes away uplifted and musically energized in a way that cannot be achieved through any other means. Day One – Began with meeting friends and colleagues while waiting in line to register, some of whom I hadn’t seen in almost 40 years. I was fortunate to have two of my best friends with me, Nancy Braithwaite (pictured left), and John Reeks who is a veteran of many ICA conventions and has even hosted them a few times in his home city of New Orleans. He introduced me to scores of people while we also soft-pedaled our presentation that was to take place a few days later. 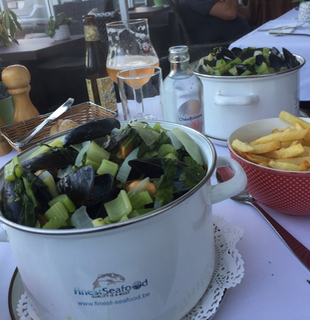 A walk on the beach (Ostend is a harbor city with a great boardwalk), a dinner of steamed mussels (moules nature), and an early bedtime in order to get started bright and early the next day. clarinets. The cacophony of clarinet noodling, orchestral excerpts and the opening phrases of the Mozart Concerto can be a little overwhelming. Restraint is also necessary so as not to make too many impulse purchases. Later that morning John Reeks and I made our way over to the Conservatory to try out the acoustics and computer/tech aspects of our lecture/performance in the room where we would be presenting the following day. 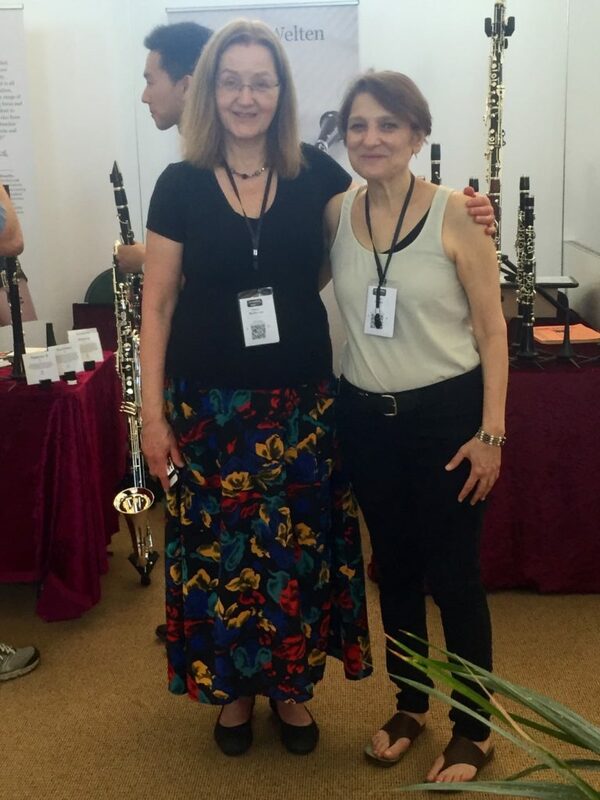 Our presentation on the musical contributions to the clarinet world by my father, Harold Seletsky, included a PowerPoint, live and recorded demos and a full performance of one of his quarter-tone compositions. There were a few glitches getting all of the moving parts to work properly (iTunes, Google Slides, microphone, etc.) but I left fairly confident that it would go smoothly the next day. After a light lunch of smoked herring at a great nearby cafe I went back to the lecture hall. The schedule listed a presentation taking place at 3:00 pm but I knew that the person giving the lecture was not, in fact, in Ostend. I thought I could use the time for more computer practice. This wound up being very fortuitous because the 10 people or so in the room waiting to hear the scheduled lecture wound up getting a sneak preview of mine and most of them came the next day to hear my presentation in full! From there I went to a performance by a Peruvian Clarinet Quartet followed by a wonderful recital by John Yeh who has been in the Chicago Symphony since shortly after I met him at a summer music festival in 1977. Then to the Thermae Palace Hotel for some schmoozing at the Buffet Crampon Happy Hour. Day Three – Began with a master class given by a true klezmer master – the great Giora Feidman. The room was packed with devoted followers who hung on his every word – most of which was about playing music and not the clarinet. Some other offerings from him were that the breath is the connection to the inner still voice, and that applause is poisonous to the performer (although in his concert performance that evening he generated lots of applause). He is a kley zemer in the truest sense – a vessel or conduit for inspiration. At 1:00, the lecture/performance John and I worked so hard on, came off without a hitch. Those in attendance seemed fully engaged throughout and appeared to really appreciate it. We sold out of our CDs and generated interest in the music of my Dad, which was our ultimate goal. That evening I enjoyed another dinner of mussels when taken to dinner by company executives for Uebel Clarinets; my friend from Holland, Nancy Braithwaite, is their clarinet rep and she invited me along. This was followed by one of the highlights of the entire festival: the evening concert which featured Giora Feidman followed by Anat Cohen. Giora’s backup group has the same instrumentation as my klezmer ensemble – violin, guitar, acoustic bass and accordion – and hearing their arrangements gave me many ideas for modulating textural and rhythmic accompaniments so as to make, what is essentially very simple folk music, into a musical experience that holds the audience at every moment. Anat Cohen’s performance after the intermission blew my mind – her playing is so imaginative and colored and absolutely unique. She has a jazz sound but it’s warm and rich, her pitch and technique are flawless and her inflections are such like I’ve never heard before. I stood in line to buy her album after the show. immediate difference in m tone – clarity and warmth without spread. Always a goal for clarinetists. I could still chirp and gliss and krekht for my klezmer playing too. I agreed immediately to promote the product to my students, colleagues, local music stores, etc. I’m a convert! 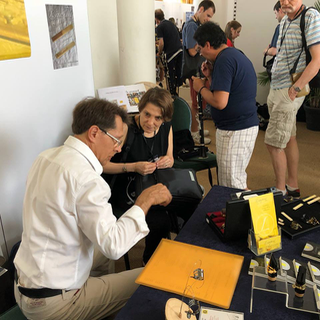 Day Five – Began with an early morning presentation by Stephen Fox and Nora Muller on their collaborative venture of creating the Bohlen Pierce clarinets which use a 13-tone tuning system over a 12th instead our familiar 12-tone system over an octave. It was fascinating to hear the instruments and the compositions written for them. Back to the Exhibition Hall where I took part in a spontaneous klezmer jam. Very fun. my training. I basically wore out the LP of his performance of Weber’s Concerto in F minor when I was preparing to perform the piece for the first time in 1982. That evening brought another experience that was more than just a concert – Anthony McGill performed the Copland Concerto with the Brussels Philharmonic and, honestly, words can’t describe it. It was like hearing an angel playing the instrument. It wasn’t about his perfect fingers, pitch, articulation (which of course they were). Rather, it was his sound and musicality. His tone is so warm and uniform and the way it was animated by his breath was above and beyond anything I’d ever heard before – and this was after a week of hearing some of the greatest clarinetists in the world! Following the concert there was a jazz combo playing in the main hotel with attendees sitting in on clarinet. 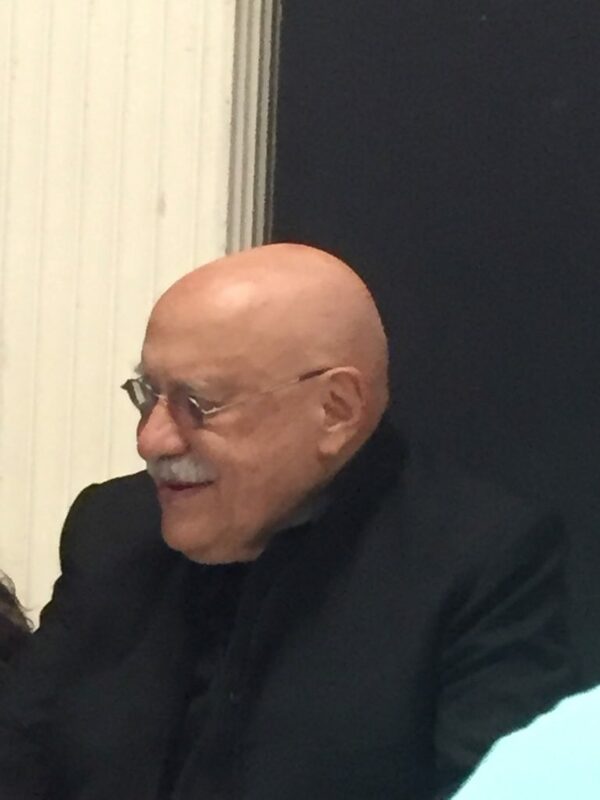 The crowd went wild when the legendary Paquito D’Rivera came down from his room and joined the combo. 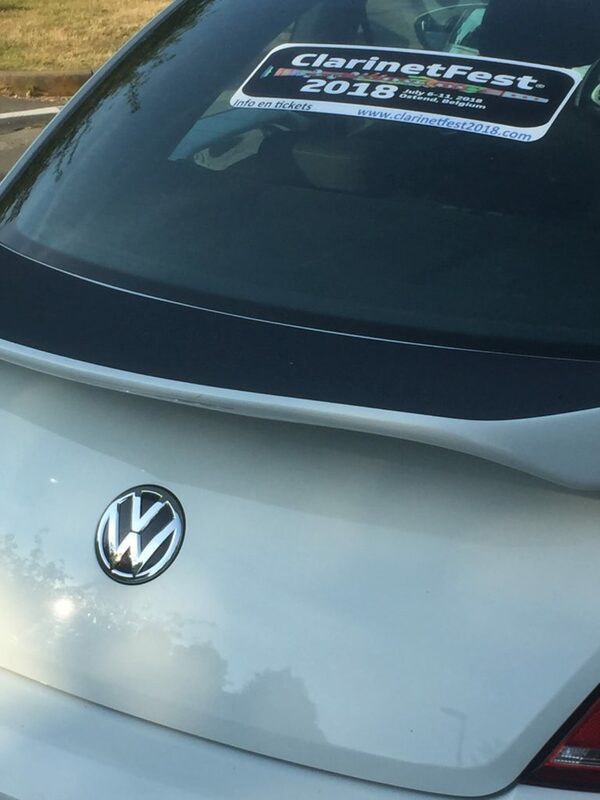 Get the name and number of the tech people ahead of time. Make sure you can text them in case a tech problem comes up in the middle of your presentation.